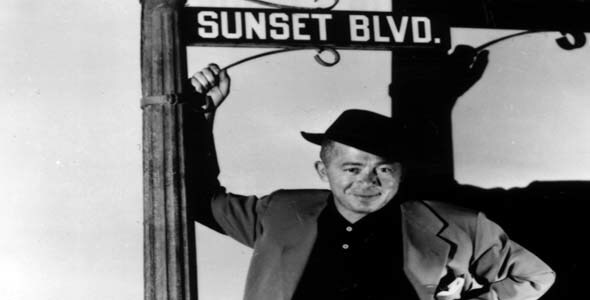 From the late 1930s to the early 1960s, Billy Wilder dominated Hollywood’s Golden Age. With over fifty films and six Academy Awards to his credit, he is one of Hollywood’s all-time greatest directors, producers and screenwriters. His films range from stark melodrama, like DOUBLE INDEMNITY (1944), THE LOST WEEKEND (1945) and SUNSET BOULEVARD (1950), to antic farce, such as THE SEVEN YEAR ITCH (1955) and SOME LIKE IT HOT (1959), to satiric comedy, like A FOREIGN AFFAIR (1948) and THE APARTMENT (1960). Billy Wilder has had a powerful creative influence on both the experimental and traditional film industries in America. He was born Samuel Wilder on June 22, 1906 in Sucha, then part of the Austro-Hungarian Empire. His father, Max Wilder, who died in 1926, ran a chain of railway cafes. His mother Eugenia had spent several years in the United States in her youth. She nicknamed her younger son “Billy” because of her fascination with legendary American hero, Buffalo Bill. Wilder briefly studied law in Vienna before obtaining a newspaper job writing interviews, crime and sports stories, and hard-hitting personal profiles. In 1926, Wilder’s interests led him to a publicity job with the American jazz bandleader Paul Whiteman in Berlin. He remained in Berlin writing for the city’s largest tabloid. In 1929 Wilder had his first break working on the German film MENSCHEN AM SONTAG (People on Sunday). He remained in Germany co-writing and directing films until the rise of the Nazis forced him to move to France, and ultimately to the United States. Wilder arrived in Hollywood in 1934 with virtually no money and little knowledge of English. He worked on and off until 1938, when he began a long and fruitful collaboration with Charles Brackett. Their partnership, which lasted twelve years, produced a succession of box office hits including HOLD BACK THE DAWN (1941), DOUBLE INDEMNITY, THE LOST WEEKEND, and SUNSET BOULEVARD. DOUBLE INDEMNITY, co-written with Raymond Chandler was a tense and thrilling film noir, while SUNSET BOULEVARD investigated the bizarre and tragic life of a once famous silent movie star. Both proved Wilder’s ability to create successful and artistic cinema. The 1950s saw Wilder produce several films alone including STALAG 17 (1953) and THE SEVEN YEAR ITCH, before teaming up with the writer/producer I.A.L. Diamond in 1957. The two would collaborate for over twenty years, producing such major hits as WITNESS FOR THE PROSECUTION (1954), SOME LIKE IT HOT and THE APARTMENT. Wilder’s career was one of the most various and successful in the business. While he often wrote and directed penetrating films about the shallowness of modern life, he was capable of creating equally successful comedies. Often running into criticism for his presentation of taboo topics such as alcoholism and prostitution, the high quality of the films redeemed him in the eyes of both the public and the industry. Of the many great stars he directed, Marilyn Monroe, Marlene Dietrich, Shirley MacLaine, Jimmy Stewart and Jack Lemmon are only a few. The late 1960s and 1970s, however, were not as kind to Wilder. His brand of cynicism, irony and satire were out of step with this generation’s view of peace, love, revolution and individual experimentation. Nonetheless, in 1964 the Museum of Modern Art in New York presented a sixteen-film, thirty-five-year, retrospective of Wilder’s work. Similar showings were later held in Paris, Berlin and Los Angeles. He has received many awards and tributes including the National Medal of Honor (awarded by President Clinton). Today, Wilder’s films remain an important part of American culture, and he is viewed as one of Hollywood’s greatest successes.